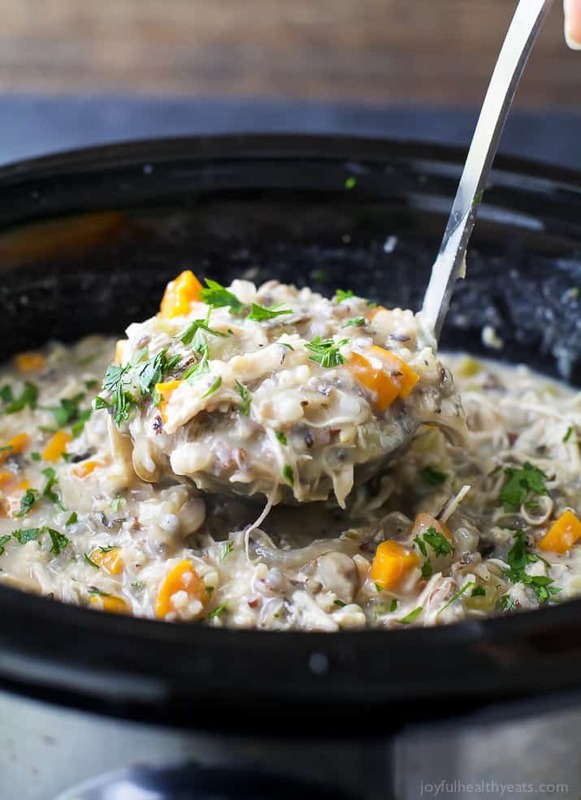 Easy Crockpot Chicken & Wild Rice Soup | Only 5 Min Prep Time! 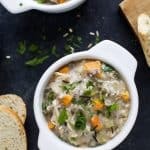 This creamy Crockpot Chicken and Wild Rice Soup is so easy to make and perfect for cold winter nights!! 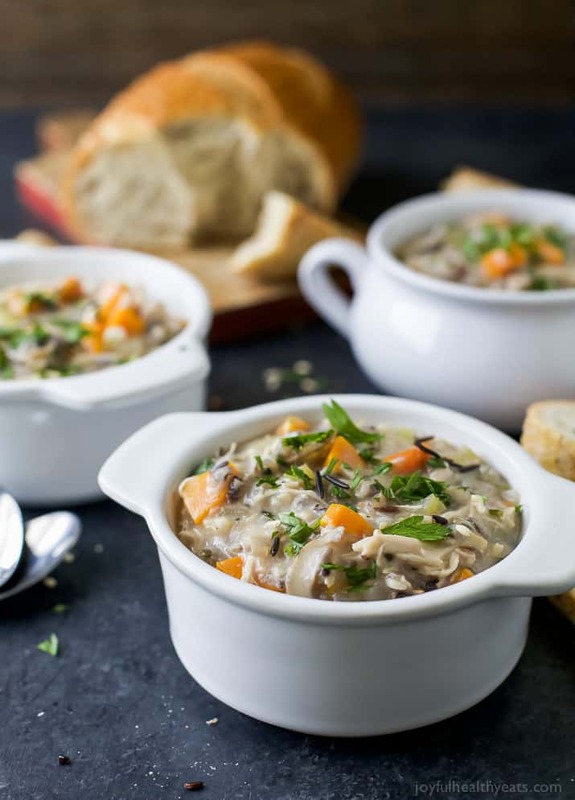 A hearty and comforting soup recipe filled with rich flavors. 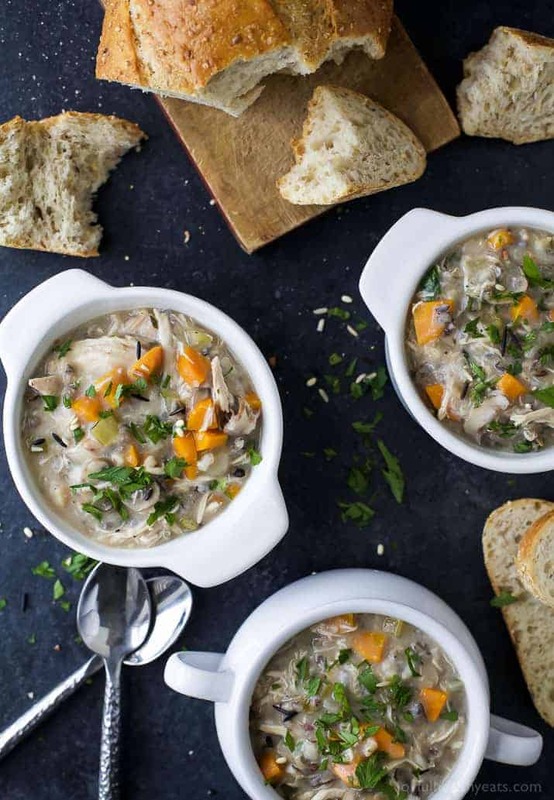 This easy Crockpot Chicken and Wild Rice Soup goes perfectly with a slice of crunchy bread. It’s also a gluten free and a great set-it-and-forget-it dinner idea with only 5 minutes of prep time. In the beginning of my pregnancy, before I could say anything to you guys I was dreadfully sick. I could barely look at food without feeling nauseous. We ate out probably 3-4 times a week because I couldn’t stomach cooking. Let’s just say it’s a pure miracle I was able to get posts out for y’all. During this time one of my favorite things to eat and one of the only things that would settle my stomach was soup. I think soup automatically gives you the “feel goods.” There is something comforting about it. It just calms you down no matter how your day has gone. And for me, it calmed my stomach down. Which was a BIG bonus in my book. I would make Mike run to Panera at least once a week to get me their Chicken & Wild Rice Soup. It’s one of my favorite soups besides of course their signature Broccoli and Cheese soup! 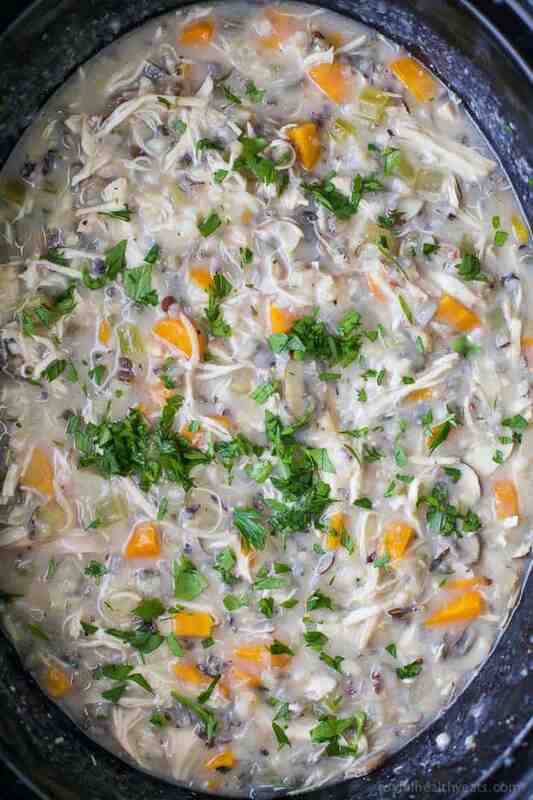 So since then I have been on a mission to make the ultimate Chicken & Wild Rice Soup. And guys I think I’ve got it! First off, it’s made in a crock pot. As in, it’s literally the easiest soup you’ll ever make. I made this recipe in the morning by just throwing everything in the crock pot and turning it on. A couple hours later I added in the milk mixture and voila. Thick creamy deliciousness that is the epitome of comfort food! 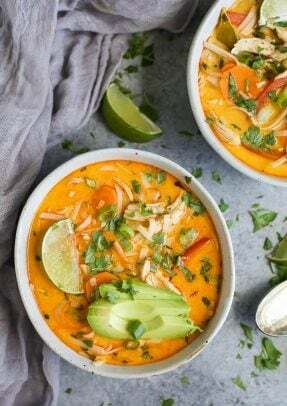 This soup is actually now one of my husbands favorites, in fact, he asked me to make it again. Which he normally doesn’t do, partly because he knows I’m always creating new things. But he’s pushing for a repeat on this one. My mom even asked for the recipe the day after we made it because the flavors are on POINT and she loved how easy it was. 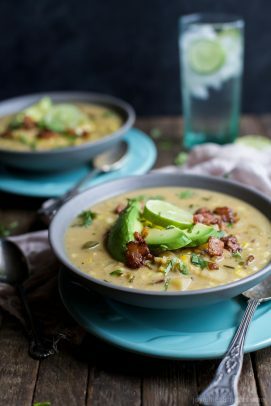 Guys this soup is a must make for the fall! In my opinion this soup is better than the Panera version. It packs more of a flavor punch. I guarantee you’ll love it, even the kiddos will devour this one. Which is a bonus because it’s loaded with veggies, protein and good nutrients! Each serving is only 213 calories with 17 grams of protein. 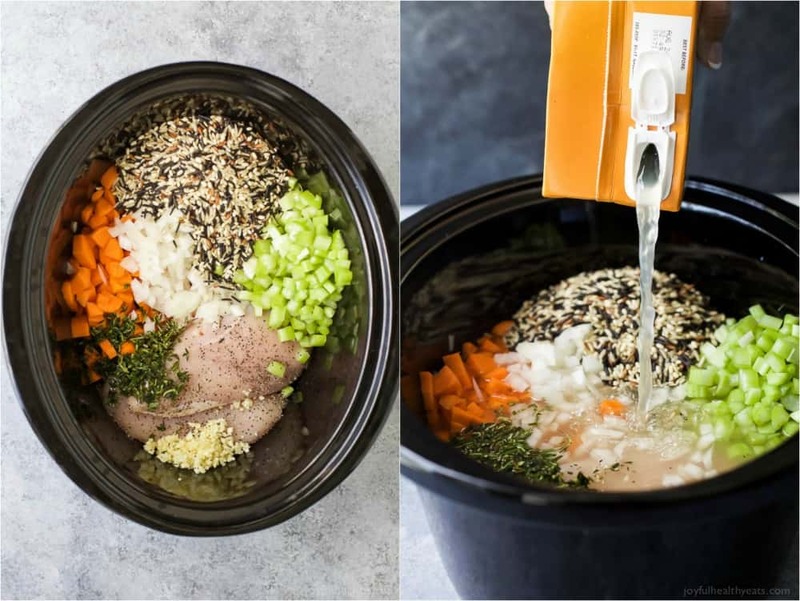 So what are you waiting for, go out, get those ingredients throw everything in the Crock Pot and wait for deliciousness to show up on your dinner table. 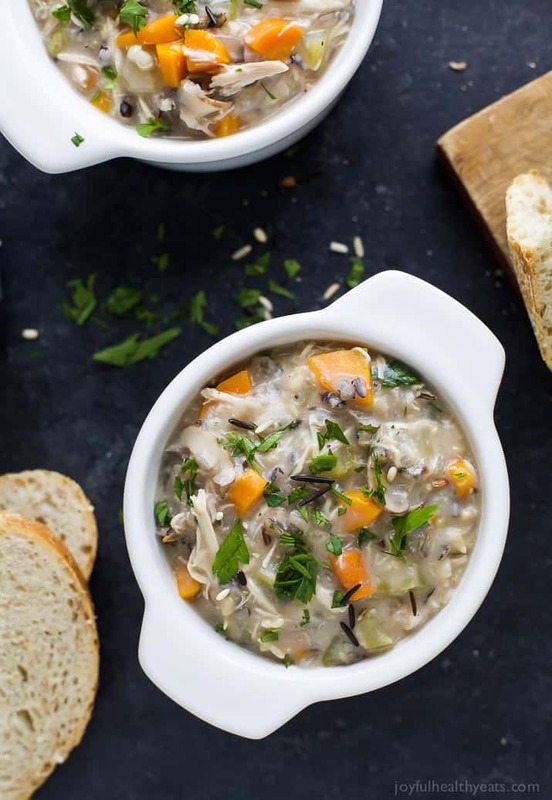 This easy Crockpot Chicken & Wild Rice Soup goes perfectly with a slice of crunchy bread. It’s a great weeknight dinner idea with only 5 min of prep time. To a crock pot, first add boneless skinless chicken breasts on the bottom. Season with salt and pepper. Then add carrots, celery, onion, garlic cloves, rosemary, thyme, wild rice and chicken broth. Cook on HIGH for 3 – 3.5 hours. Remove chicken from the crock pot and shred with two forks. Add chicken back to the crock pot. Heat a small sauce pan to medium high heat. Add butter to the pan. Let the butter melt and start to bubble, whisking the entire time to ensure it doesn’t burn. Once the mixture is a light brown color pour the milk in and add corn starch. Whisking the entire time until milk is incorporated and there are no lumps. Let milk mixture simmer for 2 minutes until thick. Pour milk mixture into the crock pot and stir. Next add mushrooms and stir. Let cook an additional 30 minutes. 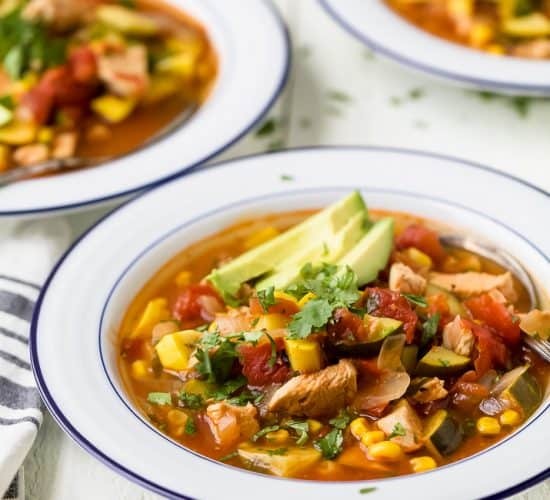 Want More Comfort Soup Recipes? Wow this looks so comforting and perfect for cooler weather! YUM! There’s nothing better than a soup of soup with crunchy bread! This looks wonderful! Chicken soup is so good! Loving this version! Do you know what the carbs are? They seem to be missing from the nutrition information. Looks delicious. How many carbs per serving ? HI! Just so you know, the fact that this recipe includes flour makes it decidedly NOT GLUTEN-FREE. I’m sure it’s delicious and I plan on making it without the flour, but it’s definitely false advertising to say it does not include any gluten ingredients. Hey Hally, sorry it was a mistake when I was clicking through the categories. I have since changed it. This is warming me up just looking at it! 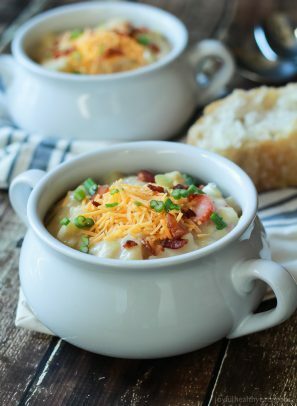 This is one of my favorite soups to make for the fall! So delicious! We always make chicken noodle soup, I have yet to make chicken and rice but man this looks so good! yes, I keep it on high for the 30 minutes and then turn it off. It should freeze fine. I’d recommend letting it completely cool, then store in freezer safe bag. Let it thaw in the refrigerator overnight and then you can warm it up again. This looks good, but it isn’t gluten-free… it has flour in the recipe. I hope it works with corn starch and plan to try it. yup, that was my fault. clicked the gluten free button too fast, I just updated it. yes it should work with cornstarch or arrowroot. This recipe is marked as gluten free, what floor do you recommend to make it gluten free?